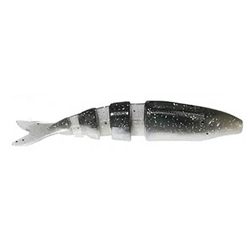 Lake Fork's Live Action Magic Shad is the ultimate swimbait designed for alive action swimming motion of a live fleeing baitfish. This bait is very versatile; you may rig it weightless, Texas Rig, Carolina Rig, Drop Shot Rig, Wacky Rig, Nail Rig, or Jig Head Rig. The Magic Shad comes with a special molded-in hook slot that allows for easy rigging of a jig head or worm hook making the lure virtually weedless for fishing heavy cover. This bait is an irresistible likeness of the real thing with its natural shad body and a unique spade shaped tail that sets up a vibration when the lure is retrieved, or even on the fall.